The 1935 Monaco-Trossi race car, a rare example of automobile use. The Wasp Major, a four-row radial. Packard DR-980 diesel radial aircraft engine. A Nordberg Manufacturing Company two-stroke diesel radial engine for power generation and pump drive purposes. ^ It has been claimed that the NACA cowling generated extra thrust due to the Meredith Effect, whereby the heat added to the air being forced through the ducts between the cylinders expanded the exhausting cooling air, producing thrust when forced through a nozzle. The Meredith effect requires high airspeed and careful design to generate a suitable high speed exhaust of the heated air - the NACA cowling was not designed to achieve this, nor would the effect have been significant at low airspeeds. The effect was put to use in the radiators of several mid-1940s aircraft that used liquid-cooled engines such as the Spitfire and Mustang, and it offered a minor improvement in later radial-engined aircraft, including the Fw 190. ^ "Firing order: Definition from". Answers.com. 2009-02-04. Retrieved 2011-12-06. ^ "zoche aero-diesels homepage". zoche.de. Retrieved 30 May 2016. ^ a b Vivian, E. Charles (1920). A History of Aeronautics. Dayton History Books Online. ^ Day, Lance; Ian McNeil (1996). Biographical Dictionary of the History of Technology. Taylor & Francis. p. 239. ISBN 0-415-06042-7. ^ Lumsden 2003, p. 225. ^ Nahum, Andrew (1999). The Rotary Aero Engine. NMSI Trading Ltd. ISBN 1-900747-12-X. ^ Gunston, Bill (1989). World Encyclopedia of Aero Engines. Cambridge, UK: Patrick Stephens Ltd. pp. 29, 31 & 44. ISBN 1-85260-163-9. ^ Bilstein, Roger E. (2008). Flight Patterns: Trends of Aeronautical Development in the United States, 1918–1929. University of Georgia Press. p. 26. ISBN 0-8203-3214-3. ^ Herrmann, Dorothy (1993). Anne Morrow Lindbergh: A Gift for Life. Ticknor & Fields. p. 28. ISBN 0-395-56114-0. ^ "The Spirit of St. Louis". Charles Lindergh: An American Aviatior, Retrieved 21 August 2015. ^ Lewis Vintage Collection (2018), "'Rare Bear' web site.". Retrieved: 6 January 2018. ^ Aerospaceweb, "Aircraft speed records." AeroSpaceWeb.org. Retrieved: 6 January 2018. ^ "Aircraft". Culp Specialties. Retrieved 2013-12-22. ^ "Verner Motor range of engines". Verner Motor. Archived from the original on 6 October 2014. Retrieved 23 April 2013. ^ "MONACO - TROSSI mod. da competizione". museoauto.it. Retrieved 10 November 2016. ^ Thurston, David B. (2000). The World's Most Significant and Magnificent Aircraft: Evolution of the Modern Airplane. SAE. p. 155. ISBN 0-7680-0537-X. ^ Some six-cylinder inline engines used as few as 3 bearing but at the cost of heavier crankshafts, or crankshaft whipping. ^ Fedden, A.H.R. (28 February 1929). "Air-cooled Engines in Service". Flight. XXI (9): 169–173. ^ Chapter 1: Development of the Diesel Aircraft Engine" Archived 2012-02-12 at the Wayback Machine Aircraft Engine Historical Society — Diesels p.4 Retrieved: 30 January 2009. ^ Aviation Chronology Retrieved: 7 February 2009. ^ Pearce, William (18 August 2014). "General Motors / Electro-Motive 16-184 Diesel Engine". oldmachinepress.com. Retrieved 30 May 2016. ^ "Bock radial piston compressor". Bock.de. 2009-10-19. Retrieved 2011-12-06. 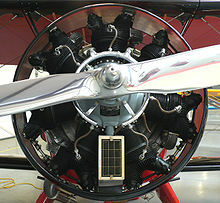 Wikimedia Commons has media related to Radial engine.